Hello, hello, hello! Today I am going to be sharing my first book review of 2018. As part of a blog tour, hosted by the lovely Jennyinneverland, I am going to be reviewing The Eden Paradox*, written by Barry Kirwan. 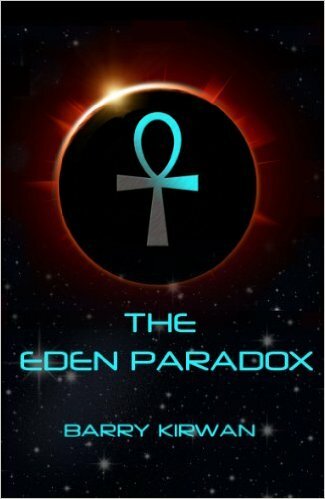 I was really excited to be given the opportunity to take part in The Eden Paradox blog tour, the whole premise seems intriguing; and as I am currently planning a potential PhD around the topic of Scifi in literature, reading The Eden Paradox seemed like the perfect form of procrastination! A lot of Scifi novels involve aliens invading earth and mankind's struggle to defeat them - but what happens when mankind become the 'aliens' that are doing the invading? "A murder... a new planet mankind desperately needs... a thousand-year-old conspiracy... What really awaits us on Eden? In a world beset by political turmoil, environmental collapse, and a predatory new religion, a recently discovered planet, Eden, is our last hope. But two missions have failed to return. Blake Alexander and his crew lead the final attempt to bring back good news. Meanwhile back on Earth, Micah Sanderson evades assassins, and tries to work out who he can trust as he struggles in a race against time to unravel the Eden Paradox..."
You are plopped right into the middle of the action from the very first chapter, the fast pace makes you forget about how little you know of the dystopian world at your fingertips, instead, you want to know why our current protagonist has murdered someone, and why of all places, he has stuffed him in a ceiling. "People rarely search for bodies in ceilings, Gabriel O’Donnell reminded himself. He should have a couple of hours before anyone discovered his latest victim. Slipping unseen from the side door, he dissolved into the amoebic mass of dignitaries arriving for the fund-raiser at Eden Mission Control. He itched to shed his tuxedo and starched shirt, but he needed the camouflage"
The Eden Paradox is the first in a four-book dystopian scifi series set fifty years in the not so distant future. Both the plot and the characters explore some pretty tough themes including, the fate of the human race, and whether or not we have a place in the universe outside of Earth. The earth, whilst full of recognisable places, is unrecognisable - climate change is killing our once beautiful planet, and the only hope for the survival of the human race is for them to find a new place to call home. I will admit that it took me a while to get into, but once I was in, I WAS IN. I read it over the course of a few days, and it was brilliant. The enigmatic writing style and the opportunity to explore a not so distant future was enthralling. Fancy winning a £20 Amazon gift voucher? *This Novel was provided by Neverland Blog Tours in return for a non-bias review. All thoughts and opinions are my own. Affiliate links have been used in this post. Please see my disclaimer for more details. Wow Kirstie thank you for such a fab review of the book! So glad you enjoyed it and I’m sure Barry will be thrilled! I wish I was already studying for my PhD. I am still in the research/saving up stage at the moment. I'll get there eventually though! Oooh I love when a book throws you in at the deep end! It's so intriguing and you can't help but get caught up in the story. I don't usually read much Sci-Fi as I get a bit confused but this sounds really good! Thank you for sharing such an excellent review!